Not content to simply bring Marvel fans awwwwmazing apparel, this summer Simone Legno's Tokidoki will charm whatever your heart desires with clip-on Marvel Frenzies. Zippers, keychains, phones and anything else offering an anchor for dangly denizens. 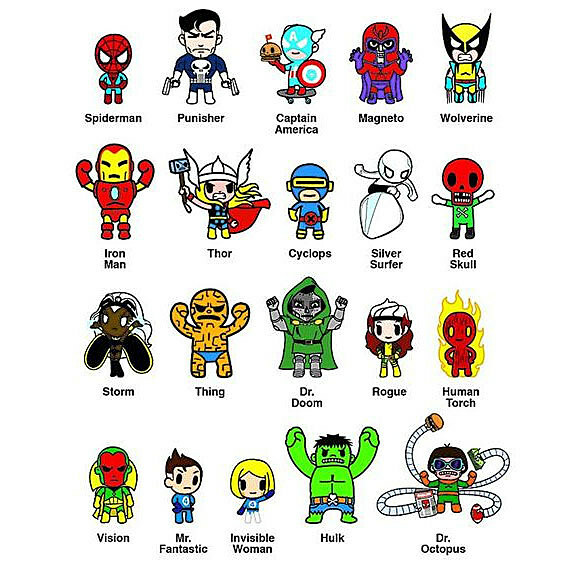 Basically imagine Tokidoki's current Frenzies, only designed in the mighty Marvel manner.Initial preorder graphics on BigBadToyStore show the line will be 30-strong, with Spider-Man, Punisher, Captain America, Magneto, Wolverine, Iron Man, Thor, Cyclops, Silver Surfer, Red Skull, Storm, Thing, Dr. Doom, Rogue, Human Torch, Vision, Mr. Fantastic, Invisible Woman, Hulk and Doctor Octopus all present and account for so far. I wonder which other ten characters will make the cuteness cut? Each of the Frenzies will come in blind mystery box packaging for around $6-7, or you can annihilate the challenge by preordering the whole set for $165. There's no firm release date for the Frenzies yet, but BBTS is estimating their products will arrive in July.